Tim and Martie are teenagers going through a tough time. Their father is suffering from PTSD, which has evoked their mother's depression, and slowly, their lives are heading in a downward spiral with the family at breaking point. But, when Tim and Martie come across an ancient Christmas ornament with a spellbinding secret, they find themselves sent centuries into the past in search of a new hope for their family. They're not the only ones who can hunt through time though; with every movement watched by the fearsome Trackers, there's only so much travelling Tim and Martie can do without evoking a response. Soon, Tim and Martie find themselves in a deadly race to get back home, but can they save their family in the process? I think that I should start with a little disclaimer that while this book seems to be targeted towards teens, and in the YA genre, I actually think it would be more appropriate for it to be read by Middle-Grade students. 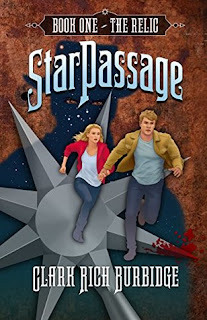 For that reason, I will be writing this review of StarPassage as if it is a Middle-Grade book. I'm no expert, but in my opinion, this book would be fantastic for children who know someone suffering from a mental illness such as PTSD or depression. I loved the way these illnesses were portrayed throughout the course of the book, and I actually think reading this would be a great alternative to factual books for children as it would allow the readers to have the ability to relate themselves to the characters within StarPassage so they can understand what is normal to feel and can begin to grasp why feelings like this may occur. I honestly thought the plot of StarPassage was brilliant. I'll admit, the whole idea did seem a little confusing for me to begin with, what with the time travel aspect, but I soon grasped the storyline and I thought it was a really fun and quirky way to tell the story. The storyline itself was engaging and entertaining and kept me wanting to read the book, which, of course, is a great quality! I do think a younger audience would probably respond better to the story than I did, mainly because I would view this story as one that might engage younger readers more than older ones. Nevertheless, I did truly enjoy the story, and I thought the ending was appropriate, while leaving a good cliff-hanger for the following book in the StarPassage series. For me, the writing was the part of the book that didn't quite do the story justice. I enjoyed it, don't get me wrong, but at times, it seemed that the author was 'reporting' the story rather than 'telling' the story. I thought that some of the dialogue seemed a tiny bit forced at times, and parts didn't feel appropriate for the characters; personally, I would say that the family spoke to each other in dialogue that just seemed too formal. I felt that this did improve over the course of the book, but this was what stopped me from awarding the book 4 stars. However, I did enjoy how much factual information was slipped into the story, which often went into a good amount of depth. Particularly in children's books, I enjoy reading factual pieces of history mixed into the fiction, as it gives the readers an opportunity to learn the history, sometimes subconsciously, while reading the main story too. In terms of the characters, I thought that Tim and Martie were engaging protagonists who nicely balanced each other out. They were good heroes for a novel of this type and I think children would easily be able to relate to one or the other of them. Personally, I would have preferred for Tim and Martie to have been explored in a depth that didn't revolve around their parents' mental illnesses, as most of the back story for them was centred on their reaction to their father's PTSD. It would have been nice to read about another side of them too. However, since I feel that this book was written with a main purpose of addressing PTSD and other mental illnesses, the depth of the characters was probably still an appropriate amount. 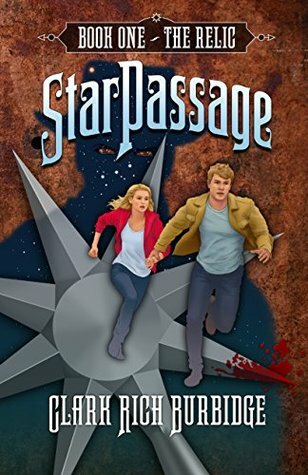 Overall, I did thoroughly enjoy reading StarPassage: The Relic, but I would recommend it more for ages 9-14 as I feel that children in that age group would respond in a better way to the story. So, while I did enjoy it, I would only give this novel 3.5 stars as I thought the writing slightly let the book down and there possibly could have also been a little more depth within the characters. However, I still think this book would be a great read for someone in the same situation as Tim and Martie as I think StarPassage would be a really helpful book! Thanks again to PR by the Book for providing a review copy of this book!